Sculptural installation and live performance commemorating a now-demolished cave. 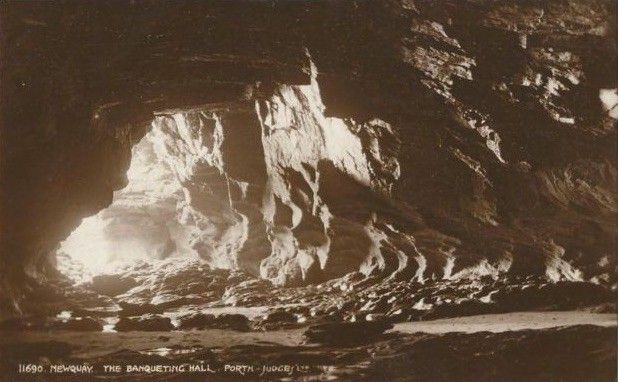 A large wooden structure will be temporarily sited on a Cornish cliff to commemorate the 'Banqueting Hall Cavern' which in the early 20th century was used as a concert venue during low spring tides. Later deemed unsafe it was secretly dynamited to destruction in 1987. Timed to coincide with one of the lowest tides of the year a brass band will perform on the beach at the site of the cavern with the sound relayed above to a sculptural scale-model rendition of the cave. A newly compiled sound piece will later be broadcast from the structure evoking elements of the Brass ensemble’s recital. The Lost Cave Requiem is supported by Arts Council England Grants for the Arts and The Elephant Trust.